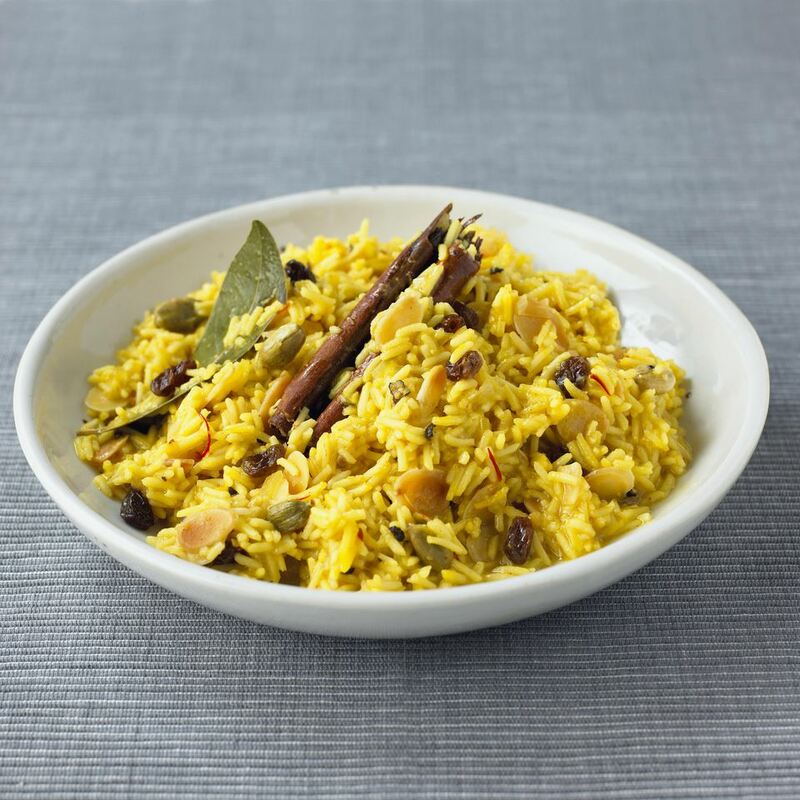 This delicious side dish recipe for Potato and Basmati Rice Pilaf is the perfect dish to serve to introduce your family to Indian cuisine. The dish can be vegetarian if you use vegetable broth, but you can use chicken broth if you'd like. You can use russet or Yukon Gold potatoes for this dish. Don't use red potatoes; they aren't firm enough to stand up to the long cooking time. If you use Yukon Gold potatoes, use two, since they are smaller than russet potatoes. Basmati rice is an important ingredient; you can substitute long grain regular white ​rice, but the dish won't be as fragrant. Basmati rice smells like popcorn when it's cooking. It's easy to find in most large grocery stores. To toast the sliced almonds, the easiest method is to cook them in the microwave. Place the nuts on a microwave-safe plate. Cook on high for 1 minute, then stir. Continue cooking on high for 30-second intervals until the almonds are fragrant and light gold. They will darken a bit as they stand. The potatoes are first cooked until they turn golden. Then spices and rice are added, and the whole thing is topped with broth. The dish simmers until the potatoes are golden brown and tender and the rice is perfectly cooked. Currants and chopped dried apricots add wonderful flavor, texture, and color to this recipe. You can serve it as a main dish, or as a side dish to grilled steak, roasted chicken, or a pork loin roast cooked in the slow cooker. Heat the oil in a large heavy skillet and add onion. Sauté and stir for a few minutes, then add diced potato. Cook and stir until potatoes are golden, 6 to 8 minutes. Then stir in cumin, turmeric, saffron threads, salt, and basmati rice; cook and stir for 1 to 2 minutes until fragrant. Add vegetable or chicken broth and water and stir gently. Bring mixture to a boil, then reduce heat to low, cover, and simmer for 12 to 14 minutes until rice is tender. Add currants, almonds, chopped apricots, and butter and stir gently. Taste for seasoning; add more salt and pepper if you'd like, then serve.